Senator Reed Continues His Efforts In Skin Cancer Prevention - Patrick Sullivan, M.D. 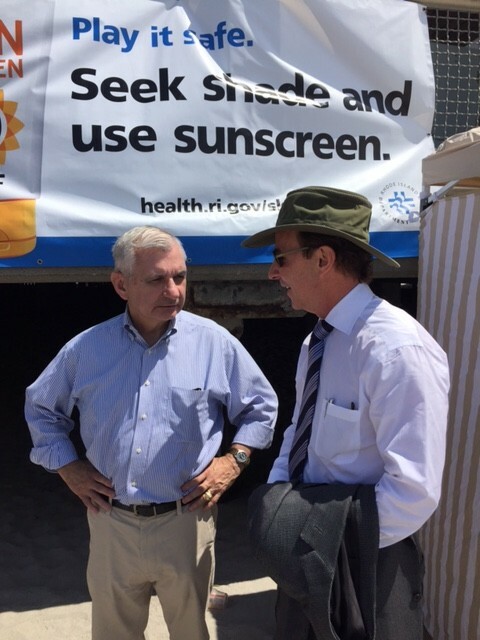 Senator Reed has formed a coalition with Rhode Island Department of Health, The Partnership to Reduce Cancer in Rhode Island, and several qualified medical professionals throughout Rhode Island to help address the growing epidemic in skin cancer. We strongly support this effort. According to the American Cancer Society, “Skin cancer is the most common of all cancers. About 3.5 million cases of basal and squamous cell skin cancer are diagnosed in this country each year. Melanoma, a more dangerous type of skin cancer, will account for more than 73,000 cases of skin cancer in 2015.” The aim of Senator Reed’s initiative is to both educate and offer free screenings to individuals throughout Rhode Island in an effort to identify and treat cases of skin cancer at the earliest stage possible. Senator Reed and Dr. Sullivan have worked together for over 17 years to promote skin cancer awareness and prevention. Dr. Sullivan and Senator Reed held a series of press conferences on this issue in an effort to highlight the importance of sunscreen and sunscreen labeling. Senator Reed was instrumental in bringing to law the Sunscreen Innovation Act which aided the U.S. in expediting sunscreen technology already in use in other countries. Senator Reed worked to ensure that American consumers have access to the safest and most effective sunscreens available and that their access to these products be granted in a timely manner. Proper utilization of sunscreen is one of the most effective ways of preventing the development of skin cancers. For more information about SPF and the importance of protecting your skin read our recent blogs: Save Your Skin, Save Your Life; and Protection: What is SPF?